This is truly a unique style Stiletto Set. Each Italian Spring Assist Stiletto style knives feature a spring assist opening with a 1045 surgical steel drop point blade. The handle also features a steel inlay design with different design overlay displaying the extensive designs on both sides of each stiletto. The blade on these knives opens powerfully and locks up solid. They also include a safety clip to prevent accidental opening. Each blade is written stiletto and 1045 Surgical Steel. Each Stiletto includes a black nylon pouch with belt loop and comes extremely sharp. This set comes with 10 unique styles Spring Assist Stiletto. Talk about an item which is screaming for attention. 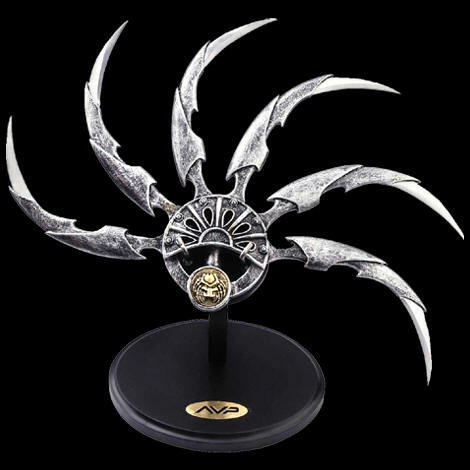 This is the AVP Shuriken. The AVP Shuriken has been given a blade around the border. The blade is sharp and is hold down by six claws which then circulate the arm holder. The blade is also stainless steel. In the movie only the Scar Predator uses this weapon in the film. This movie masterpiece comes with a blade wooden stand which also has the initial AVP in gold. 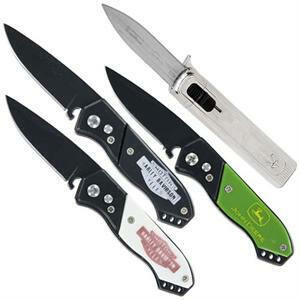 The J Deere Green Automatic Knife, Black Harley D Automatic Knife, White Harley D Automatic Knife and the Stylish OTF Knife Lighter Combo is a limited time sale and only has limited quantities. 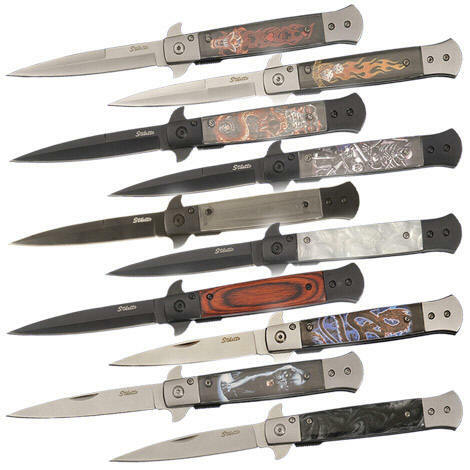 The J Deere, Black Harley D and White Harley D knives feature an all black body with their respective color insert on the handle sporting the different mascot. The blade on these knives are all black anodize with a length of 2.5 inch. 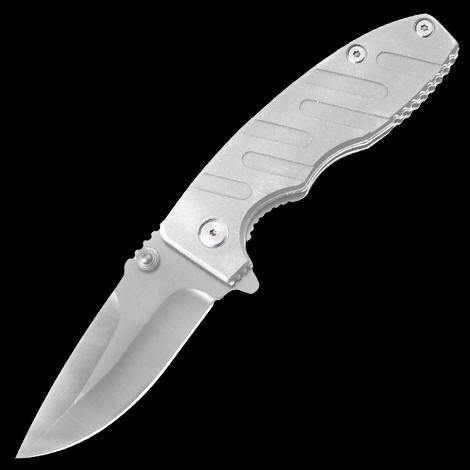 The Stylish OTF classy looking knife lighter features a dual action 440 stainless steel knife and a lighter. Just push the black button and watch the 2.25 inch blade flick and just pull on the tab on top and watch the fire burns. This set is perfect for all occasions and a great gift idea and an offer you cannot afford to miss. Summary: Automatic opening knives (switchblades) can be shipped (1) to civilian or Armed Forces supply or procurement officers and employees of the Federal Government ordering, procuring, or purchasing such knives in connection with the activities of the Federal Government (2) to supply or procurement officers of the National Guard, the Air National Guard, or militia of a State ordering, procuring, or purchasing such knives in connection with the activities of such organizations; (3) to supply or procurement officers or employees of any State, or any political subdivision of a State or Territory, ordering, procuring, or purchasing such knives in connection with the activities of such government; and (4) to manufactures of such knives or bonafide dealers therein in connection with any shipment made pursuant to an order from any person designated in paragraphs (1), (2), and (3).